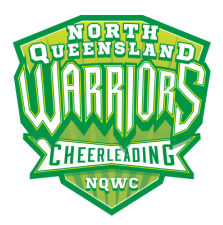 North Queensland Warriors Cheerleading (NQWC) was formed in 2009, and prides itself on a consistently high standard of performance through dedication, hard work and supportive coaching. All NQWC coaches are qualified through the USASF coach credentialing program which is recognized world wide, as well as holding current Blue Card’s & Basic 1st Aid Certificates. "What is All Star Cheerleading?" …all in a two and a half minute routine. All Star Cheer runs almost year round and athletes are taught how to increase their strength, flexibility and coordination whilst also learning important life skills such as responsibility, commitment and time management. In our inclusive environment, our athletes learn the importance of hard work, build self-confidence and forge life-long friendships.